I have a confession. I’m in a bit of a shopping rut… or at least I was. It’s that time of year when the amazing pieces from spring// summer are starting to hit your favourite retailers and the bold, bright colours and sights of shorts have you all giddy. You run to the change room, try it on and then stare in the mirror and say to yourself, “Where the heck am I going to where this right now?!? !” (Or for the next 2-3 months if you live in Canada). I’m 100% guilty of doing this. Sure, sure – we hear a lot about ‘transitional’ wardrobe items but I feel like so often I’m lost at what those items look like. Enter this trench dress from WhiteHouse Black Market. At first blush, you probably agree with me and totally love. But then you may think about it more and wonder how to incorporate it into your current situation: tights, ankle boots, thick coats and more. Love the colour palette of this outfit, and the pom pom is the perfect addition! Such a chic, inspiring and ladylike outfit! I absolutely love your sunnies and dress! This time of year is always SO boring when it comes to shopping, at least in my case, so I too often find myself shopping in my closet and trying to be creative! 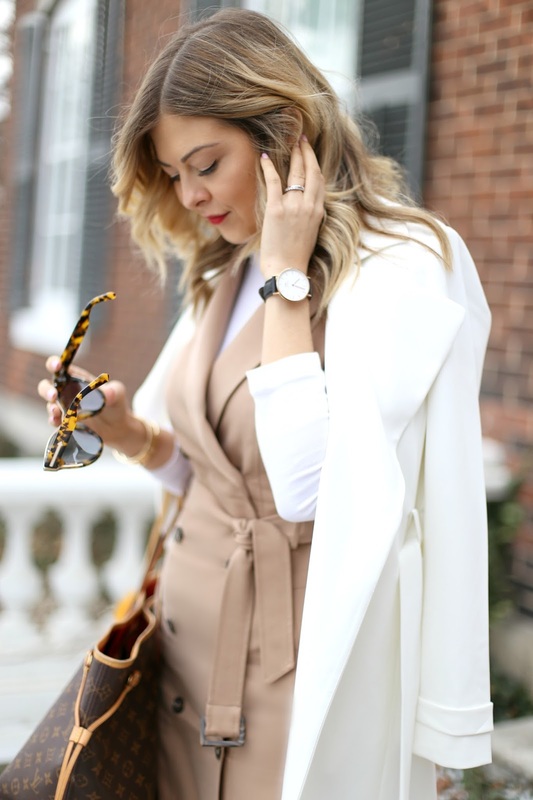 I love the way you style this trench with the heels and sunglasses, beautiful outfit! I always like to shop my closet during this time and utilize what I already own. So lovely! Love the way you layered the coats. Loving that trench dress and the leopard accents!